iMacsoft DVD to Mobile Phone Suite for Mac is powerful Mac DVD to Mobile Phone Converter and Mac Mobile Phone Video Converter suite designed just for Mac OS X users who want to enjoy their DVD and video files on Mobile Phone. 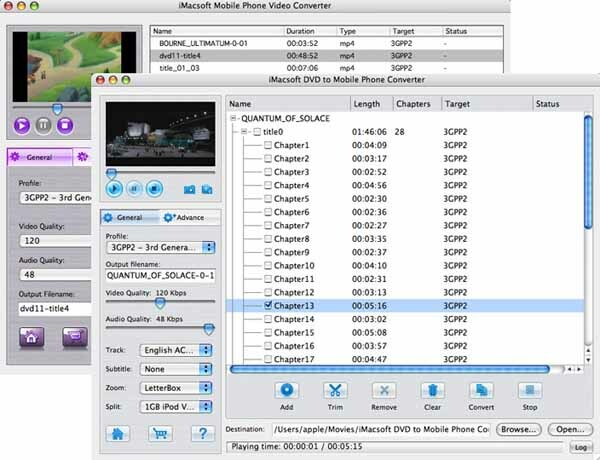 iMacsoft DVD to Mobile Phone Suite for Mac includes two powerful products: DVD to Mobile Phone Converter for Mac and Mobile Phone Video Converter for Mac. iMacsoft DVD to Mobile Phone Converter for Mac is powerful and easy-to-use Mac DVD to Mobile Phone converter, which helps you fast rip and convert DVD to 3GP, 3GPP, MP4, AVI, WMV video formats and WMA, MP3, AAC, M4A audio formats for playback on iPad, iPad 2, the new iPad, iPad mini, iPad 4, iPhone 3, iPhone 4, iPhone 5, iPhone 5S/5C, iPhone 6/6 Plus, iPod, Sony PSP, Palm, Pocket PC, and various brands of cell video phones including LG, Motorola, Nokia, Samsung, and Sony Ericsson and so on. iMacsoft Mobile Phone Video Converter for Mac can convert regular video formats to 3GP, 3G2, MPG, MPEG, MPEG2, MP4, AVI, WMV video formats and WMA, MP3, AAC, M4A audio formats for playback on iPhone 3, iPhone 4, iPhone 5, iPhone 5S/5C, iPhone 6/6 Plus, iPod, PSP, Palm, Pocket PC, and various brands of cell video phones including LG, Motorola, Nokia, Samsung, and Sony Ericsson Sony Ericsson and other popular mobile phone players. The DVD to Mobile Phone Suite for Mac is an extremely easy to use Mac DVD to Mobile Phone Converter and Mac Mobile Phone Video Converter suite. Free download it and turn your mobile phone to a moving theatre right now! iMacsoft DVD to Mobile Phone Converter for Mac, powerful and easy-to-use Mac DVD to Mobile Phone converter, can fast rip and convert DVD to 3GP, 3GPP, ,MP4, AVI, WMV video formats and WMA, MP3, AAC, M4A audio formats for Apple iPhone, iPod, Sony PSP, Palm, Pocket PC, and various brands of cell video phones including LG, Motorola, Nokia, Samsung, and Sony Ericsson and so on. iMacsoft Mobile Phone Video Converter for Mac can convert regular video formats to 3GP, 3GPP,3G2, MPG, MPEG, MPEG2, MP4, AVI, WMV video formats and WMA, MP3, AAC, M4A audio formats for Apple iPhone 3, iPhone 4, iPhone 5, iPhone 5S/5C, iPhone 6/6 Plus, iPad, iPad 2, the new iPad, iPad mini, iPad 4, iPod, Sony PSP, Palm, Pocket PC, and various brands of cell video phones including LG, Motorola, Nokia, Samsung, and Sony Ericsson Sony Ericsson and other popular mobile phone players.